Haven't tried CrossFit yet? If not, you're missing out! It’s a high-intensity workout that gives you fast results, so it’s no surprise it’s so popular right now. And with the 2014 CrossFit Games having wrapped up recently, there’s even more of a reason to give it a try for yourself. If you're not quite ready to check out your local box, you can get a taste of what CrossFit is all about with one of these workouts that you can do at home or at the gym. Instructions follow each list of exercises. Get a full-body workout in just 10 minutes! Set a timer for 10 minutes and try to do as many rounds as possible of 10 Medicine Ball Thrusters, 10 Push-Ups, and 10 Lateral Burpees without taking too much time to rest between exercises. If you push yourself, I guarantee you’ll get a great full-body workout in a short amount of time! You can work your entire body with just 4 exercises. Try to do as many rounds of the following moves without taking too much time to rest between exercises. Set a timer for 15 minutes and then start with 15 Kettlebell Swings. When you finish, move immediately to 10 Burpees, then 15 Air Squats, and finally 10 Push-Ups. When you finish all 4 exercises, you’ve completed 1 round. 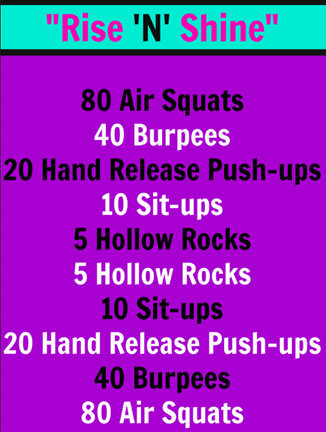 Be sure to keep track of your rounds and reps, so the next time you do this workout, you can try to do more! Everyone has 10 minutes, right? 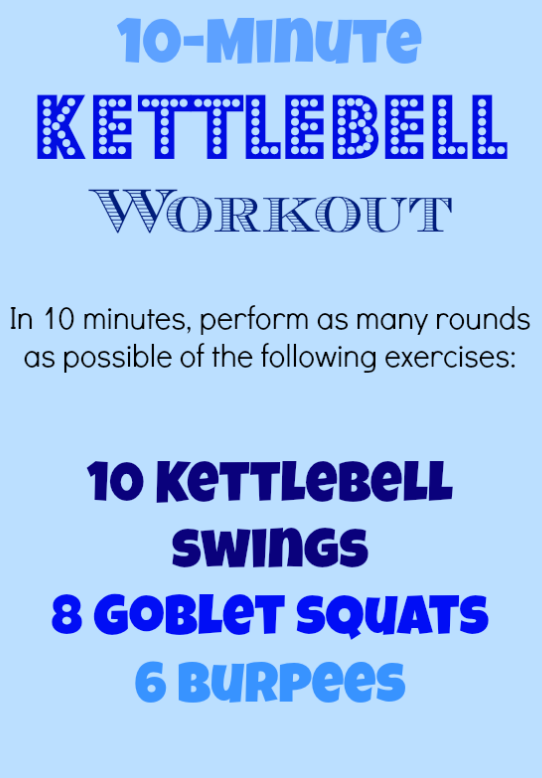 Even though this kettlebell workout is just 10 minutes, you'll feel like you had a much longer sweat session. Grab a medium-weight kettlebell and try to do as many rounds of 10 Kettlebell Swings, 8 Goblet Squats, and 6 Burpees as possible in 10 minutes. Rise 'n' shine! It's exercise time! This workout doesn't require any equipment, so you can do it just about anywhere. You just need a little bit of space. Perform all of the reps for each exercise for before moving onto the next one. So, for example, do all 80 Air Squats before starting the 40 Burpees and so on. Unsure how to do some of the exercises? Check out these video demonstrations: Air Squats, Burpees, Hand Release Push-ups, Sit-Ups, Hollow Rocks. 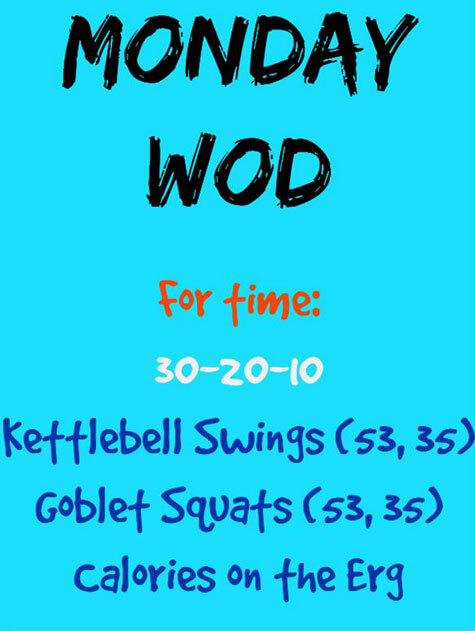 Start off the work week with this "Monday" WOD ("Workout of the Day). 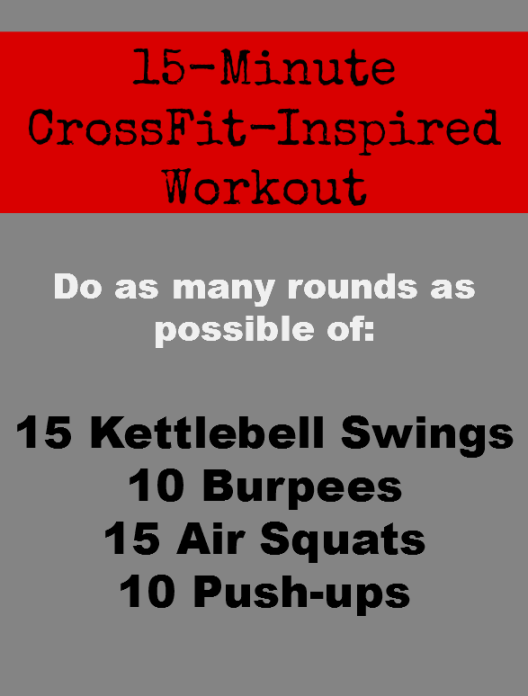 For this workout, you need a kettlebell and a rowing machine (erg). Here's how this workout works: Set a timer and then perform 30 reps of Kettlebell Swings, 30 reps of Goblet Squats, and then hop on the rower and row until you've reached 30 calories. Then, perform 20 reps of Kettlebell Swings and Goblet Squats and row 20 calories on the rower. Finish the workout with 10 reps of each exercise and 10 calories on the rower.